Senator Bernie Sanders (I-VT). Public Domain photo. 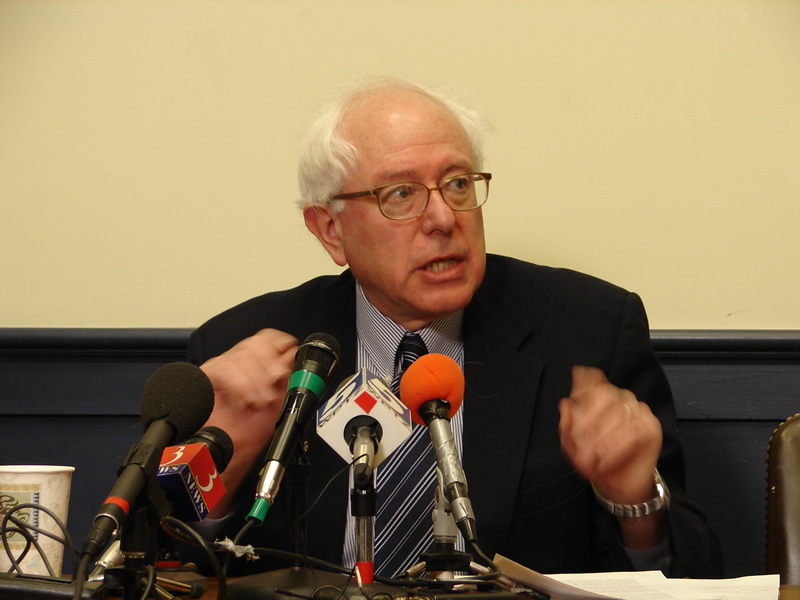 On September 7, Bill Moyers interviewed Bernie Sanders of Vermont, an independent senator for five years who served 16 years before that in the House of Representatives. Before going to Washington, he spent four years as mayor of Burlington, which was judged one of the most livable cities in the country. Sanders is proud that his last campaign was financed by 130,000 individual donors who gave an average of $40 each. This goes to the heart of his recommendation to fix what is most broken in our government: a constitutional amendment repealing Citizens United. So far, legislatures and governors in six states have voiced support for such an amendment, and millions of people have signed petitions, 200,000 of them on Sanders’ website alone. People across the political system seem to agree. Sixty-four municipalities in Vermont sent resolutions to congress calling for an amendment. I seem to remember hearing of similar efforts underway in as many as 20 states. As a concrete step, Sanders’ suggestion carries a lot more weight and plausibility than vague calls to abandon existing political parties and form new ones. That doesn’t seem feasible on our current playing field. Here is a link to Senator Sanders’ official website: http://www.sanders.senate.gov. There’s a link to the Moyer’s interview and a button labelled, “Overturn Citizens United.” If you click it, you’ll find a map showing local efforts across the nation, as well as info on how to add your local group information to the list. It’s really encouraging to see that we are not alone in our outrage. This entry was posted in Current Events, Politics and tagged 2012, Citizens United, current events, politics, Senator Bernie Sanders. Bookmark the permalink. We’re fighting a steep uphill battle in Texas, trying to get our city councils to call for an end to Citizens United like the ones in Vermont. I’m going to check out that interview you referenced. There’s a link to the Moyers interview there, contact info for Sanders, and a button labelled “Overturn Citizen’s United.” If you click it, you’ll find a link to add your group information and see a map of similar efforts across the country. I’m going to add that link to the original post. I really believe the presidential campaigns should be limited to funds designated by taxpayers on their tax form. One should be able to designate a small amount (I would like to see $10) be directed to a pool that would be evenly divided by the candidates. There should be no private donations from individuals or unions or corporations. I also think we should pass a law that limits the amount of time before the election that campaigning can commence. It would be nice if we could find ways to limit all campaigns in terms of time and money. I’m disgusted by the waste of time and money that goes on in politics. Bernie Sanders is on the right track. I hope he doesn’t get derailed. I had the same thought of Sanders getting “derailed” by a huge influx of SuperPAC money, although the small size of the state and his familiarity with it may contain an edge. He said the towns and villages have real town hall meetings, not the reality TV versions the major candidates use. One other suggestion I’ve heard is to have a series of real presidential debates on a weekly basis in the run up to the elections. Again, not the reality TV versions of the primaries, but say, an hour on Sunday nights with real questions and real moderators who would be empowered to rein in the candidates when they try to dodge the issues. From the constitutional point of view, I think there will have to be room for contributions or people using some of their own money – I mean local candidates for school board, county supervisor, state assembly have to have some way to buy signs and radio commercials, but yes, there have to be constitutional and rational ways to avoid the excess and fakery that passes for campaigning now.